Use VEX Coding Studio to create a program or open an already existing program. NOTE: If the program has already been downloaded to the V5 Robot Brain, you can skip to Step 4. 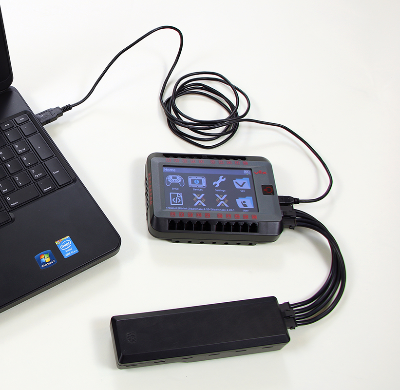 Connect the V5 Robot Brain, a charged V5 Battery, and your computer. Power on the V5 Robot Brain. Click the Brain selection icon and highlight your connected V5 Robot Brain to ensure VCS recognizes there is a V5 Robot Brain plugged in and the firmware is up to date. Click outside the selection window to close it, then click the Download button. 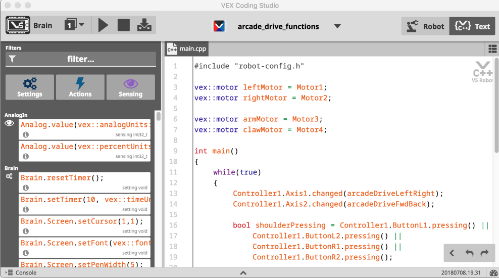 Click the Run button in VEX Coding Studio to run the program while the robot is still connected to your computer. NOTE: Be careful - if the robot will be moving, it could pull on the USB Cable! You may want to support the robot on something so it will not move.